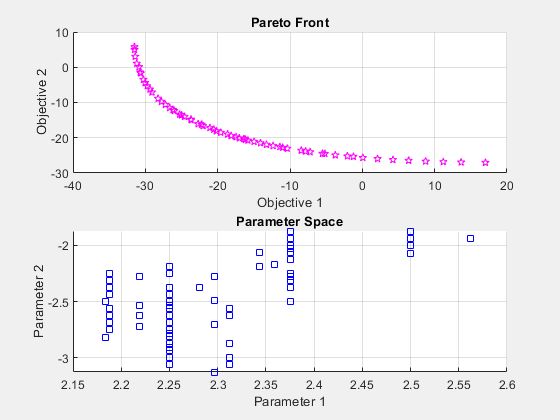 This example shows how to create a set of points on the Pareto front using both paretosearch and gamultiobj. The objective function has two objectives and a two-dimensional control variable x. The objective function mymulti3 is available in your MATLAB® session when you click the button to edit or try this example. Alternatively, copy the mymulti3 code to your session. For speed of calculation, the function is vectorized. Find Pareto sets for the objective functions using paretosearch and gamultiobj. Set the UseVectorized option to true for added speed. 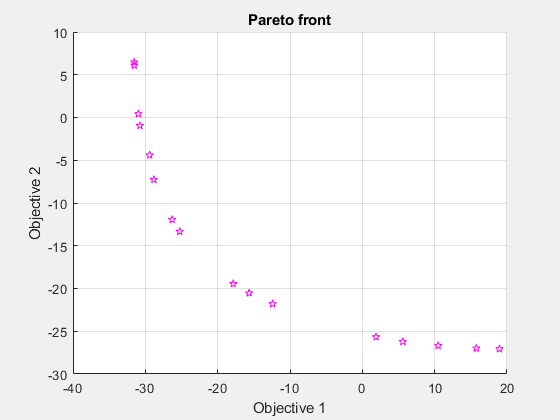 Include a plot function to visualize the Pareto set. Pareto set found that satisfies the constraints. 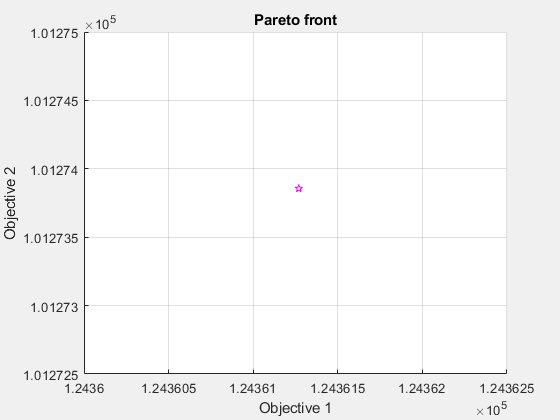 Compute theoretically exact points on the Pareto front by using mymulti4. The mymulti4 function is available in your MATLAB® session when you click the button to edit or try this example. The mymulti4 function evaluates the gradients of the two objective functions. Next, for a range of values of x(2), use fzero to locate the point where the gradients are exactly parallel, which is where the output mout = 0.
gamultiobj finds points with a slightly wider spread in objective function space. 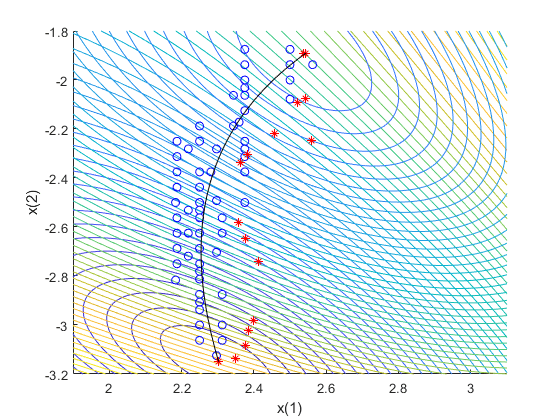 Plot the solutions in decision variable space, along with the theoretical optimal Pareto curve and a contour plot of the two objective functions. 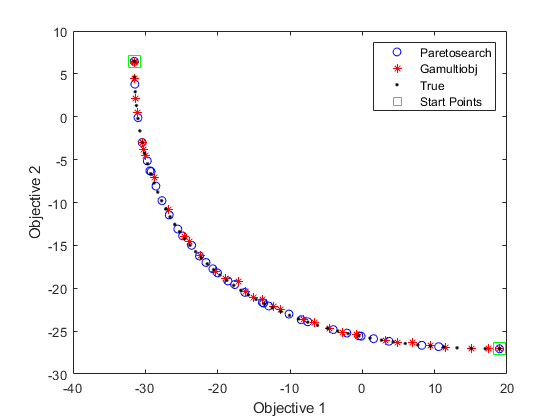 Unlike the paretosearch solution, the gamultiobj solution has points at the extreme ends of the range in objective function space. 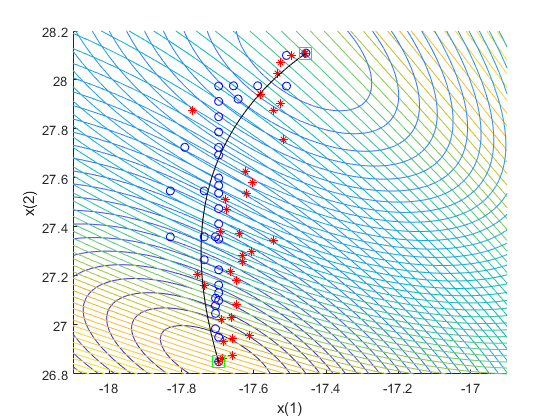 However, the paretosearch solution has more points that are closer to the true solution in both objective function space and decision variable space. The number of points on the Pareto front is different for each solver when you use the default options. What happens if the solution to your problem has control variables that are large? Examine this case by shifting the problem variables. 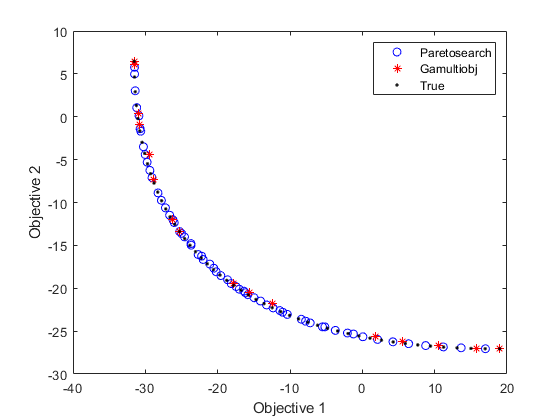 For an unconstrained problem, gamultiobj can fail, while paretosearch is more robust to such shifts. For easier comparison, specify 35 points on the Pareto front for each solver. 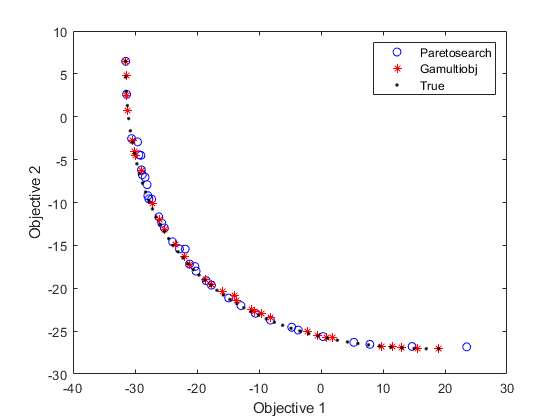 gamultiobj fails to find a useful Pareto set. paretosearch finds solution points spread evenly over nearly the entire possible range. Adding bounds, even fairly loose ones, helps both gamultiobj and paretosearch to find appropriate solutions. Set lower bounds of -50 in each component, and upper bounds of 50. In this case, both solvers find good solutions. Obtain a similar range of solutions from the solvers by starting paretosearch from the gamultiobj solution. 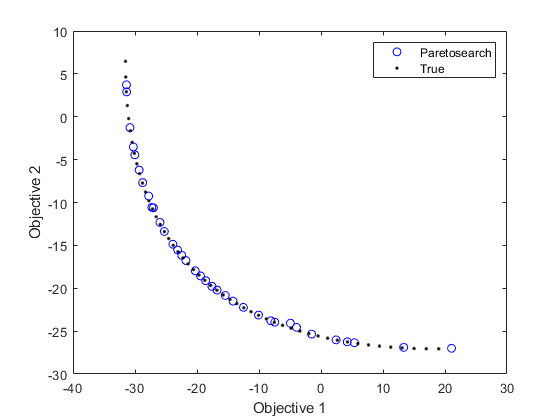 Now the paretosearch solution is similar to the gamultiobj solution, although some of the solution points differ. Another way of obtaining a good solution is to start from the points that minimize each objective function separately. From the multiobjective function, create a single-objective function that chooses each objective in turn. Use the shifted function from the previous section. Because you are giving good start points to the solvers, you do not need to specify bounds. Start paretosearch from the single-objective minimum points and note that it has a full range in its solutions. paretosearch adds random initial points to the supplied ones in order to have a population of at least options.ParetoSetSize individuals. Similarly, gamultiobj adds random points to the supplied ones to obtain a population of at least (options.PopulationSize)*(options.ParetoFraction) individuals. Now solve the problem using gamultiobj starting from the initial points. Both solvers fill in the Pareto front between the extreme points, with reasonably accurate and well-spaced solutions. View the final points in decision variable space.